Alright. I'm sure some of you are familiar with Yoshoku cuisine. If not, it is Japanese-style Western food, much like a Hong Kong-style cafe. There aren't a lot of restaurants in town that dedicate solely to this type of cuisine. 29th Avenue Cafe is probably the first one that comes to mind in this regard. 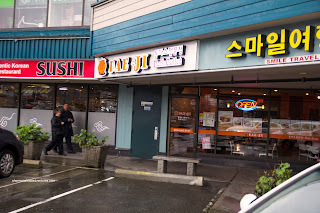 Now, what if we went one step further and took the Korean version of Japanese-style Western food? Then we have Dae Ji Pork Cutlet House. 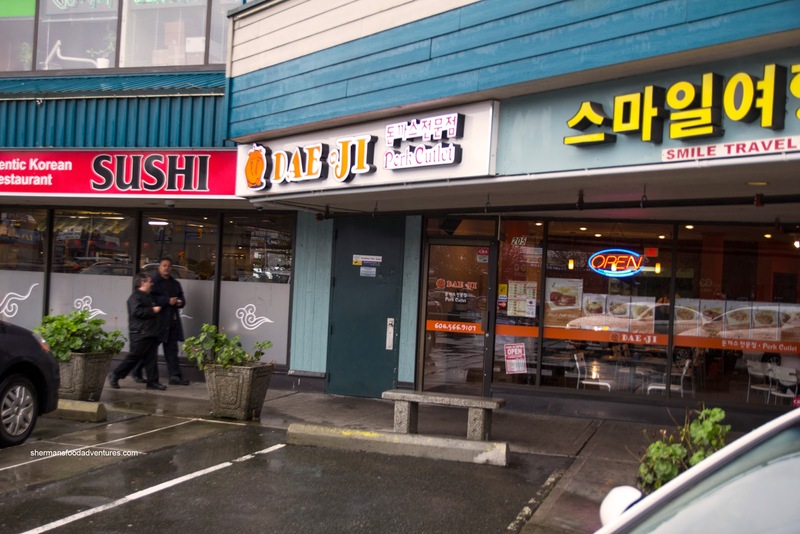 Nestled within Korean central in Burquitlam, it serves up Tonkatsu and Hamburg steak in many different iterations - like with curry, cheese and even pizza sauce. Continuing on with my culinary assault of North Road, Viv and I decided it was time to get our meat-on at Dae Ji. Naturally, we wouldn't be able to visit a place that has pork cutlet in its name without trying it out. So we went for the Curry Pork Cutlet to start. It was a very substantial portion for $8.50 with 2 gigantic cutlets fried ever-so-crispy. The meat was firm and dense, yet wasn't particularly dry either. The mild curry was there for moisture rather than spice. We loved the potatoes as they were soft while retaining their shape. The dish was completed with some rice, corn, macaroni and shredded cabbage. Solid dish, nothing outstanding, but we'd eat it again. Second item was the Hamburger Steak which was equally large with 2 plump patties which probably weighed 1/2 pound each. Despite the thickness, the meat was cooked all the way through while maintaining a moist and juicy texture. This was pretty remarkable since the meat itself wasn't particularly greasy. The sweet onions inside really added a pleasant flavour while the sauce was thick and mild with a slight tang. I actually loved this dish more than the cutlet. As if this wasn't enough food for 2 people, we went ahead and got the Kimchi Fried Rice as well. And of course it was a large portion with a beautifully fried egg on top. The rice was a bit wet and plenty greasy, however, there was good spice (not too spicy) with a nice amount of kimchi. Again, not an OMG fried rice, but solid nonetheless. Hey, for the prices they charge, the food in our opinion is a bargain. Each dish can feed 2 people and overwhelm 1 person. Despite not being the exact same thing, it makes one wonder how Saboten can charge so much for so little in comparison. Take it from me, go to Dae Ji, you won't go away disappointed. - Despite the many iterations of cutlets, the menu is simple, so you'd better like pork cutlets and hamburger steak! Yes, there are very few yoshoku restaurants unless you really hunt around. My current favourite is Moncton Cafe in Steveston. Such a cute name with an unassuming store front, but what food! To me, this is the best of the yoshoku cuisine available in the Lower Mainland. They are one of the few places where I can get hamburg steak with demi glace sauce. They even have their own dessert chef who makes amazing desserts. Prices are a little higher but so worth it. They also have lunch specials with the typical tonkatsu, curry and hamburg specialties.